Is insulated vinyl siding right for you? 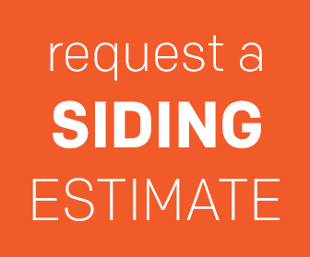 If you’re considering new siding, you’re preparing to make a big investment in your home that most people make only once or twice in a lifetime. New siding can dramatically improve the appearance of your home’s exterior and make you feel like you have a new house at the same address. Buying siding nowadays can be similar to buying a telephone. Back in the day, when you purchased a phone it did one thing: allowed you to make phone calls when you plugged it into the wall. Now most phones are mobile, can call, text, be a camera, a GPS for directions, and so much more. Since people typically only buy siding once in a lifetime, they’re generally only focused on improving the appearance of their home, and don’t realize all the other benefits that advanced materials can provide. It is important to do the job right the first time and select the siding that will bring the most value for your investment. Here are our eight signs that insulated vinyl siding may be the right siding for your home exterior project. Many people struggle with which energy-efficient upgrades will provide the most energy savings for the investment, but it’s a no brainer that adding insulation can help reduce utility bills. Did you know that 35% of energy loss in a home is through the walls? This is compared to 25% through the roof, 15% through foundation, 15% through doors, and only 10% through windows. The side walls of your home take up the most surface area. Although most homes built after the 1970’s have fiberglass insulation in the cavity, the insulating value has likely been compromised. This is because 25% of the wall surface is made of wooden studs that are not insulated - that’s like having one entire wall of your home with zero insulation. Cavity insulation can also settle over time. By using insulated vinyl siding, you can wrap your home in an energy-saving blanket of insulation which will reduce your energy loss and help lower your heating and cooling bills, putting more money in your pocket and helping pay back your investment. See the video below on how to minimize energy leaks in your home. Not only can adding insulation help reduce your utility bills, but by doing so it also makes your home more comfortable. Do you have a bedroom of your house that is too warm to enjoy during the summer months? Is there one corner that feels particularly cold and drafty in the winter? If your home is under insulated, it can make your home uncomfortable, forcing you to turn up the air conditioning or add layers of clothing. Insulated vinyl siding reduce your utility bills as we mentioned in sign #1, but it can also make your home environment more enjoyable. Insulated Vinyl Siding wraps your whole home in a blanket of insulation, helping to keep heat where it belongs: inside in the winter and outside in the summer. The primary goal of new siding is to make your home look fabulous, but many siding products aren’t designed with protecting your home in mind. In fact, some products like traditional vinyl siding can create a hollow gap between the siding and your home, leaving it susceptible to impact damage. Are there any spots on your home where your siding is cracked, dented, or chipped? Common areas for damage are at the base of the wall (such as from rocks thrown from lawnmowers) or at the corners of the home. Hail, the neighbor’s baseball, and other objects can leave your home susceptible to damage. Insulated vinyl siding features contoured insulation that is custom shaped to fit the exact profile of the siding. The insulation acts as a shock absorber, taking the impact then returning to shape, protecting the siding during the blow. In addition to bulk water, did you know the average family of four generates 4-6 gallons of water vapor inside a home daily? This comes from activities like cooking, showering, ironing clothes, and even just breathing! Installing insulation helps tighten up a home to reduce energy loss, but it’s important to make sure the water vapor generated inside is still able to escape through the walls. Insulated vinyl siding features a perm rating of 3.5, making it over three times more breathable than traditional insulation products that are installed with new siding. If you live in a wet climate or have seen signs of moisture problems on your home such as mold development on the siding, then insulated vinyl siding could be right for you. It can be very distressing when termites or other pests begin to infiltrate your home from the outside in. Not only can pests like termites cause serious structural damage to your home, but others such as bees or wasps can threaten the health of your family. The insulation in insulated vinyl siding is treated with a mild insecticide which protects the foam from termite damage. When they try to take a bite out of the insulation, they’re killed. By covering your home in insulated vinyl siding, you’re adding another layer of protection against termites. And you can rest easy knowing that the insecticide in insulated vinyl siding is completely safe for your family and pets; in fact, it is used in much higher concentrations in dog and cat flea and tick collars. The contoured foam in insulated vinyl siding completely fills the gap behind the siding, eliminating space for other pests to nest, such as bees, snakes, and birds. With traditional vinyl siding jobs, the corners create a particularly large gap between the siding and the wall. Insulated vinyl siding is installed with insulated corner posts which fill these gaps and help protect your home from all sorts of pests. Do you live near a busy roadway? Does your neighbor start up his lawnmower too early on a Saturday? Do you have a new baby that struggles to stay asleep? If any of these things are true for you, then noise pollution may be a problem in your home. Noise can be considered a pollutant when it interferes with normal activities or is unwanted in the home. Adding a blanket of foam insulation around your home can help cut down on outdoor sounds that infiltrate your home, making for a more enjoyable environment. For example, take two foam coffee cups and place them over your ears. You will see a noticeable difference in the amount of sound that is received, and it is only a thin piece of foam. Now imagine how much sound transmission can be reduced when your home is wrapped in a 1-½” thick piece of insulation. Listen to what these homeowners have to say about how insulated siding reduced outside sounds in their home. Insulated vinyl siding can reduce sound transmission by up to 39%. This confirms homeowner claims that having insulated vinyl siding installed made their homes quieter than before. Download our white paper on insulated vinyl siding and sound transmission now to learn more. Over time, most homes will settle, causing the walls to shift somewhat. Although this doesn’t typically cause a structural problem, it can cause your exterior walls to bow or be slightly concave. If the wall surface is not perfect when new siding is installed, some products will follow the curvature of the wall, creating an imperfect appearance. When you invest in new siding, you want it to look good for a long time to come, not instantly imperfect. Insulated vinyl siding features a thick piece of foam insulation which helps cushion the siding and level out the wall, reducing the appearance of wavy wall syndrome. These days many of us are too busy to worry about time-consuming, tedious maintenance of our home. Time at home can be so limited, would you rather spend it doing maintenance or relaxing? Siding such as wood, cedar shake, and fiber cement can require routine maintenance such as caulking, scraping, repainting or staining. Even if it looks perfect when it’s first installed, regular maintenance will be required to keep up the appearance and ensure the siding continues to protect your home from the elements. For some products, you can even void the warranty if you don’t regularly patch dents, chips, or cracks. The siding you choose should not eat into your leisure time and take away from other activities, such as spending time with your family. Insulated siding is made from contoured insulation permanently adhered to vinyl siding. Unlike other products, vinyl never needs to be painted or caulked, and can be easily cleaned with mild soap and water from a garden hose when necessary. 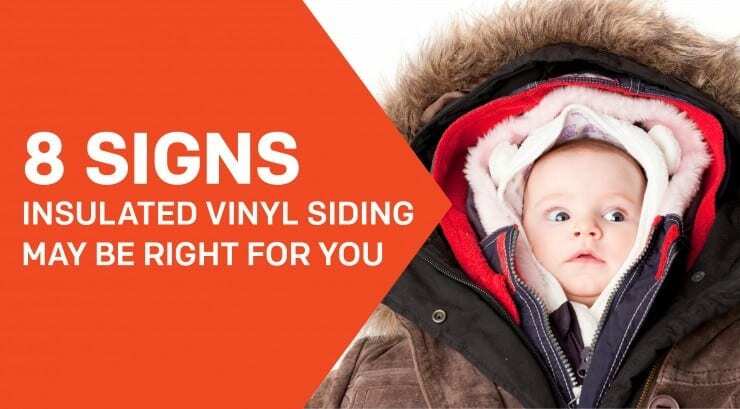 And because insulated siding significantly improves impact resistance (see sign #3), you won’t need to worry about replacing panels that have been damaged by your family or mother nature. 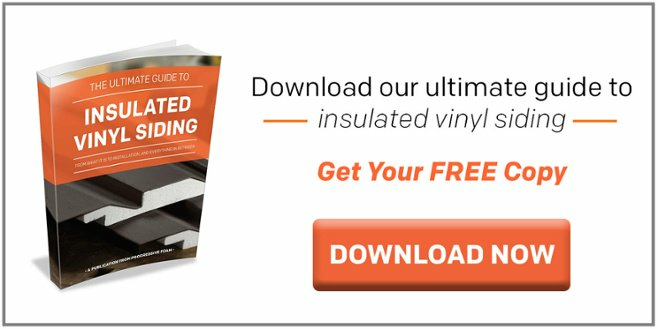 Insulated Vinyl Siding Manufacturer / Is Insulated Vinyl Siding Right for You?